VF MNH = MINT NEVER HINGED. VF MINT = MINT LIGHTLY HINGED. VF MNG = MINT NO GUM. VF USED =USED WITHOUT FAULTS. ============================================================. The price you will forget, the quality remains. British Virgin Islands 1922-28 Script set SG86/101 MM - toning behind the perfs of the 2/6. MLH/MM (etc) - a mix of MLH and MM with the majority being MLH. MLH - Mint Light Hinged - lightly hinged no hinge remainders. British Virgin Islands 1938-47 set SG110/21 MM/MNH unsorted for papers - 4 top values are MNH but the 10s and £1 have toning behind a couple of perfs - all look like chalk paper but priced as cheapest. Un certificat d'expert engage celui-ci sur l'authenticité de la pièce signée. 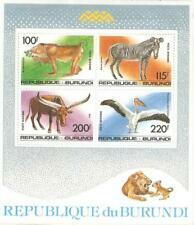 CATALOGUE VALUE 124 E. COTE 124 E. = MNH = neuf sans charnière / mint never hinged. - tous nos lots sont envoyés en recommandé. Un certificat d'expert engage celui-ci sur l'authenticité de la pièce signée. CATALOGUE VALUE 182 E. COTE 182 E. = MNH = neuf sans charnière / mint never hinged. - tous nos lots sont envoyés en recommandé. VIRGIN ISLANDS. 2 Sides of Album Page. REST OF WORLD (UPTO £40) £3.00. UK RECORDED (UPTO £100 TOTAL) £2.00. UK ORDINARY (UPTO £40 TOTAL) £1.00. British Virgin Is. 1904 SG#62, 5s Green & Blue KEVII MH #D84176. British Sterling Cheques. 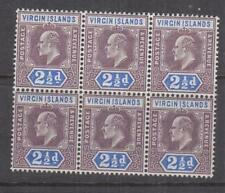 British Virgin Islands #76-113 Complete 1938-52 KGVI issues, mint H/LH. Our GST number is 10561-0547. British Virgin Islands 2017 Undersea Life Definitives - Mint Never Hinged (MNH). Set of 12 values (12v Set) (50c) - Cushion Sea Star. (15c) - Spiny Flower Coral. (80c) - Caribbean Reef Squid. =================================================. 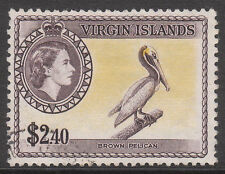 BRITISH VIRGIN ISLANDS (1904 - 1972 ). MH & USED; ALL SOUND. 32 ALL DIFFERENT. #29 - 30, #32, #35, #38 - 9, #45, #53, #55 - 6, #73 - 5, #76 - 83, #88 - 9, #102 - 104. ISSUES AS SHOWN. :- The item you receive may not be the item scanned, but will be of similar quality. Date of issue: 01 July 1982. No Exclusions. Glauben Sie, dass der Preis ist nicht richtig?. 1938-47 with many values to 1/- including papers fine mounted mint, Cat. Britiah Virgin Islands. SG Catalogue : SG727-30 MS731. 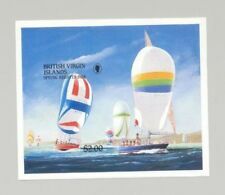 Issue : Stamp World London 90 set min sheet. Condition : mint, never-hinged(MNH). BRITISH VIRGIN ISLANDS. Date : 1990. Virgin islands 1937 Coronation set (M/mint) &1946 Victory blocks m/mint small hinge mark on margin Cat £3 . Sg 110a-121. LIGHTLY MOUNTED MINT. BRITISH VIRGIN ISLANDS. 1938-47 Set to £1. UK ORDINARY (UPTO £40 TOTAL) £1.00. (British Virgin Islands. UP TO £25 total order value). which is one of the largest in the UK. We also deal in autographs, many of which we have acquired. OVER £25, the order will. at personal signings. Un certificat d'expert engage celui-ci sur l'authenticité de la pièce signée. CATALOGUE VALUE 126 E. COTE 126 E. = MNH = neuf sans charnière / mint never hinged. - tous nos lots sont envoyés en recommandé. 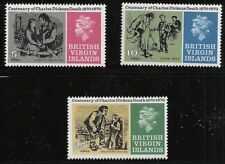 British Virgin Island 1964-68 QEII 10c both listed shades MNH. SG 185 & 185a. British Virgin Islands 1964-68 QEII 10c "Map of Virgin Islands" in the two listed shades, lake & deep lilac and bright lake & reddish lilac, both copies u/m never hinged. Gibbons # 185 & 185a. 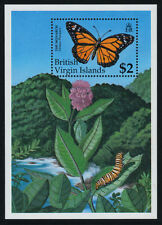 Virgin Islands Scott# 284 - 300, complete mint set, post office fresh, very well centered, original gum, Never Hinged, VF. 2019 Scott catalog value $24.50 US. MNH is mint original gum never hinged. The unissued denominations alone makes this a worthy acquisition. Virgin Islands.